With over one and half billion users, Gmail is one of the most popular email services in the world, but that doesn’t mean it’s always as easy to use as users would like.In particular, many users don’t know how to sort Gmail by sender, which is exactly what we explain in this article, while also introducing Clean Email as the best email management solution for Gmail and other popular email services. There are many reasons why you might want to sort Gmail by sender. If you’re like most people, you probably receive hundreds of marketing emails each month. It’s not uncommon for marketing emails to represent over 90 percent of the storage space occupied by emails, which is why getting rid of them is one of the first steps you should take to clean up your Gmail inbox. The problem is that marketing emails are typically mixed in with legitimate emails from friends, colleagues, and business partners, many of which may be very important and definitely not intended for deletion. If you tried to individually select every single marketing email in your inbox, you would most likely find the task very tedious, and there’s a strong chance that you would select at least a few legitimate emails by accident. By learning how to sort Gmail by sender, you can group all emails from a particular sender together and delete them all at once without also accidentally deleting emails that shouldn’t be deleted. You may also want to learn how to sort emails in Gmail by sender to save time when forwarding emails to colleagues or when searching for a certain piece of information from a specific sender. In other words, learning how to sort emails by sender in Gmail significantly upgrades your email management toolbox, allowing you to better control the steady influx of emails and stay organized and productive in today’s digital day and age. What if you’re looking for a specific email from a specific person? Let’s say an email from your boss with important contact information. You know your boss’s email address, and you know the name of the person whose contact information you need, but how can you easily find the email that contains it without going through all recent emails from your boss? You type the email address you need into the search bar at the top of the main Gmail page and click on the small down-facing arrow. A pop-up window should appear with multiple different search criteria. By default, the “Has the words” field will contain the email address you search for. Copy it and paste it into the “From” field. Use the “Has the words” field to make your search more specific by including the name of the person whose contact information you need. When you’re done, hit enter or click the blue search button located in the bottom-left corner of the pop-up window to get the specific email from that sender. You can also create a filter with your search by clicking on the “Create filter” button in the bottom-right corner of the pop-up window. This allows you to automatically apply certain actions (e.g. “Star it”) next time you receive an email that matches the specific criteria. 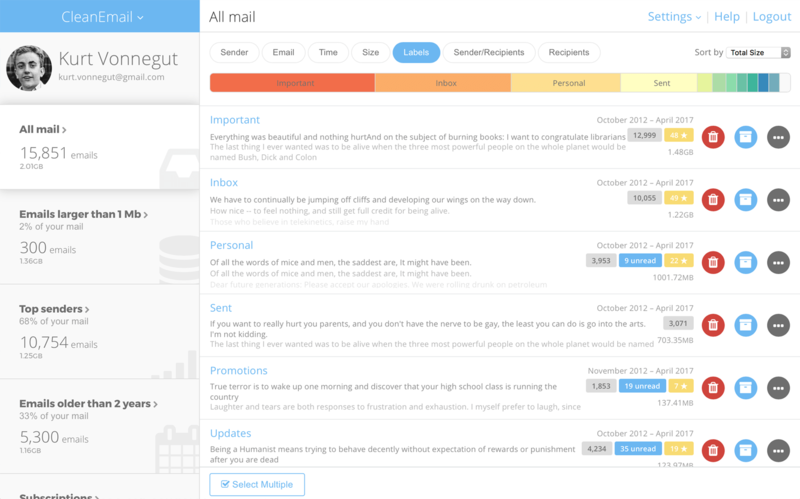 Clean Email is a popular bulk email cleaner that organizes all of your emails into easy to review bundles and allows you to remove, archive, move, label, and perform other actions on groups of emails with a single click, instead of selecting them one by one. For example, Clean Email can easily sort your Gmail account by Sender / Subject / Time / Size, etc. You will need to sign up to Clean Email for free using your Gmail account. Let Clean Email analyze your mailbox, and when it’s done, click the “All mail” box located in the Toolbar column on the left. Then click “Sender” label at the top of the screen and choose the way you want your emails to be organized by clicking “Sort by” in the top left corner (e.g. sort by Sender Email in ascending order). Now your Gmail account is sorted by Sender in your preferred order, and it is that simple. No need to search for each sender manually using Gmail filters. Moreover, you can easily apply any action to the group of emails from the same sender. Just click on the selected group (blue arrow on the right) and you will get the list of all emails from this sender. When you’re done, click “...” icon in the bottom-right corner and choose action allowing you to instantly remove, archive, or label, mark as read or unread all emails from the same sender. What’s more, Clean Email can also unsubscribe you from newsletters and unwanted subscriptions, block emails from senders from whom you would rather not hear again, and automatically apply certain actions to emails as soon as they arrive thanks to its powerful Automation features. Unlike filters in Gmail, Clean Email’s automation rules can be created and applied to all matching emails in the future with a single click. Every automation rule you create appears in the Automation dashboard, where you can pause it, modify it, or delete it. 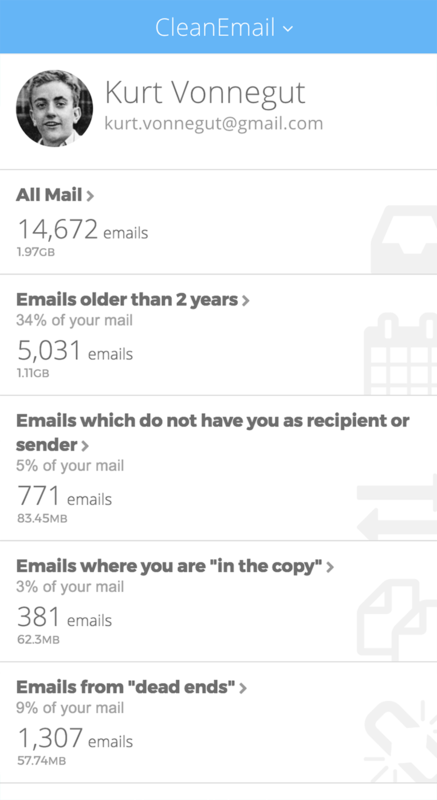 Clean Email has been designed with your security in mind, which is why it never reads the content of your emails—only the email headers, and it supports all the major paid and free email services providers. Now that you know how to automatically sort emails in Gmail, you can say goodbye to inbox overflow and manage your emails more efficiently than ever before. Remember that Clean Email can also help you with other aspects of email management by organizing all of your emails into easy-to-review bundles and allowing you to apply various actions to them.